According to Erv Evans, select plants which have brightly colored bracts and dark green foliage covering most of the stem. Avoid plants that have dropped their leaves, are wilted, or have faded, torn, or discolored bracts. This indicates the plants were not properly cared for (i.e. not watered, boxed or sleeved too long, or diseased) and the length of enjoyment of the plant will be dramatically shortened. Traditionally, the presence or absence of the true flowers or cyathia (the small, round, yellow parts located in the center of the bracts) has been the measurement of freshness. As the plant ages, the cyathia typically drop. However, many of the newer cultivars have improved cyathia retention or there are few cyathia present, which limits the use of cyathia as an indicator of age. 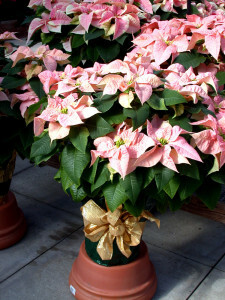 Since poinsettias are tropical plants, temperatures below 50°F will cause chilling injury. The “selling” establishment should sleeve or cover the plant when the plants could be exposed to temperatures below 50°F. 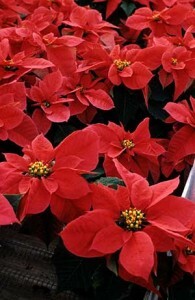 Poinsettia plants should be kept in a warm vehicle, but not placed in the trunk. Chilling injury causes the bracts to have a blue or white discoloration and possibly result in leaf drop.